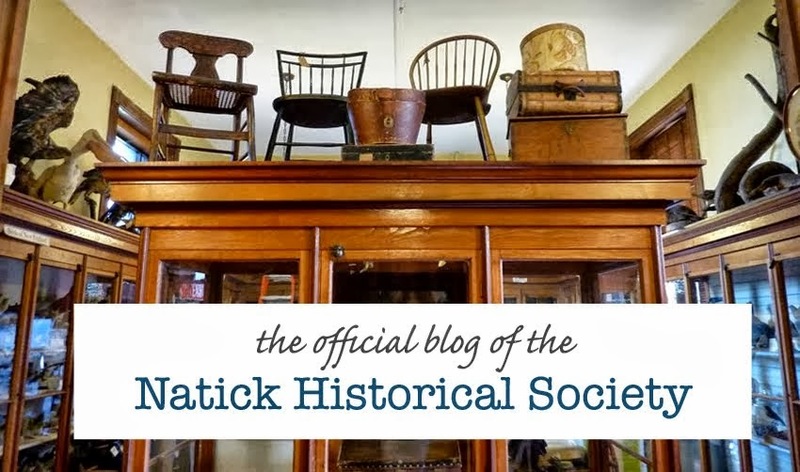 There are a number of historic sites around the town of Natick and we’re lucky enough that several of them are within walking distance from us here at the Natick Historical Society Museum. The South Natick Burial Ground, located at the corner of Eliot and Union Streets, behind the Eliot Church is one of the oldest burial grounds in Natick. The parcel of land was given to Reverend Oliver Peabody, the third minister to preach in the South Natick meetinghouse, in 1731. This land was used by the early European settlers of Natick as a place to bury their dead. Today the burial ground is no longer actively being used, but for anyone interested in genealogy or Natick's history it can provide a wealth of knowledge. made out of pink granite. Many of the original European settlers of Natick are buried in the South Natick Burial Ground. Some of the family names on many of the headstones here will likely be familiar to most Natick residents. Names of places throughout Natick take their names from these old families. Walking around one can see the headstones of Morses, Bacons, Broads, Bigelows and other early settlers of Natick. Oliver Bacon and his wife Sarah are both buried here. Oliver Bacon was responsible for the creation of the Bacon Free Library, the building shared by the Natick Historical Society. Sarah Bacon ran a small lending library out of her home, and after she passed away, her husband Oliver donated money to fund the construction of the 1880 Bacon Free Library in her honor. Oliver Bacon was also one of the early members of the historical society provided that the lower level of the building is used as a space for the Natick Historical Society and we’ve been here ever since! The beautifully carved headstones are certainly eye-catching and meaningful. Headstones in this burial ground date from the eighteenth to early twentieth centuries. Natick veterans from the Revolutionary War and the Civil War are marked with American flags and markers. Angels, willow trees and skulls, common in early American grave stone designs, can be seen on headstones. 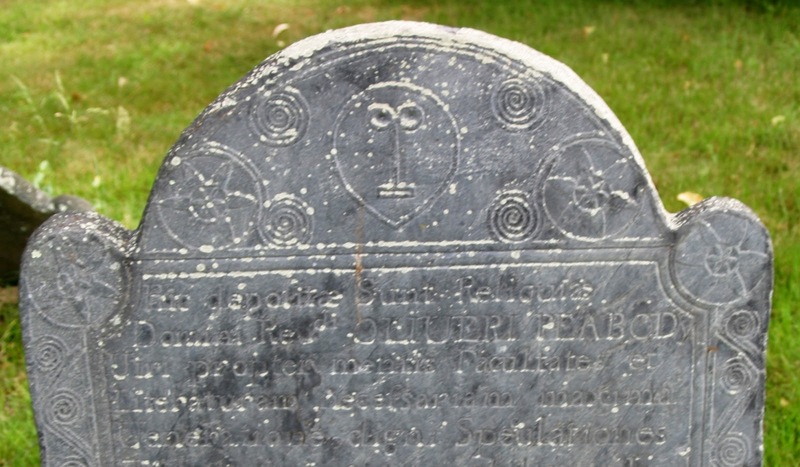 The Peabody family, longtime residents of Natick, has a set of rather unusual headstones here. The simple geometric designs of these faces are quite different from the more common ornate designs. If you are interested in learning more about some of the fascinating stories associated with the South Natick Burying Ground, please be sure to come to our upcoming Walking Tour on Wednesday October 21st at 4:30 PM and 5:30 PM. 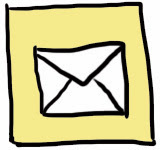 Following the walking tours at 7:00, the Bacon Free Library presents the Gravestone Girls, who will be talking headstones and graveyard designs in New England and Natick. If you are unable to join us, we’re glad to say people will also be able to take a self-guided tour of the burial ground using our new brochure available here in the NHS Museum.